I love the little pink flower head in Minnie Mouse's hand - you do detail so well! I look at the big spaces out there and lack inspiration, you find it in everything, I am so in awe!!! As always I'm amazed at the complexity of your drawings - all those tiny links and jumble of chains - how how how do you do it??? I never cease to be flabergasted at your detgails!!! I would go barmy trying to do even a quarter of this!!! Beautiful! Awesome work. You must be listening to music or talk radio while you work. This has got to take lots of time. wicked!! that eiffel tower keyring, my wife has the same one and i drew it myself last week. I'm discovering keys are fun to draw, and this is like an explosion of great keys. your detailing is incredible! I love all the different bits on it! A Fiat! An Eiffel tower! I just got lost in this fab drawing, Andrea! Just as I wonder what you will come up with next, you blow me away again. I love it.... So great ilo...! Definitely not a set of "boy's keys." I'm not sure that it could even fit in my pocket. It would probably wear a hole in my pants. I like it - enjoy it - wish I could draw like that. Mesmerizing - I could stare into these intricacies for hours! Such intricate and distinctive work. I love the way you make very ordinary things seem somehow alive, as if each item has a story it's itching to tell. Thanks for answering my question (last posting) - 20 hours is a big investment. A wonderful drawing with the perfect title! Your "madness" is a delight for our eyes! What a fabulous drawing! That is awesome. I want it. Not the keys, but the sketch for my office. Very cool Andrea. Oh, and I can't begin to tell you how much this resonates with me on discussions I've had with Ruth about her key-ball-and-chain. Ha. I'm always terribly impressed with your pen drawings. Can I ask a bit more about your process? Do you do any pencil underdrawing at all, or do you just start straight in with a pen? This drawing was never meant to be quite so big. I was drawing with a damp plaster on my little finger (I didn't realise it was damp, it's not a new technique, or anything) and it smudged the whole page. 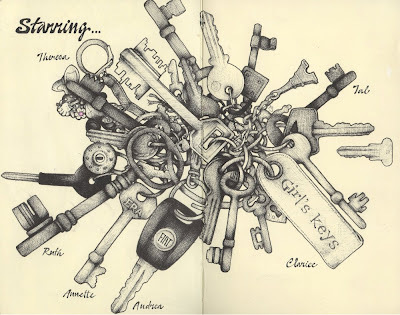 So to cover the smudges I drew more and more and more keys. TLC Illustration, I didn't use any pencil here. I do use pencil, to map out the composition, usually. But with a big drawing like this I will just dive straight in with ink. If you make a mistake, on a drawing like this, it doesn't matter too much. It can be hidden! Cheers, everyone, you make my day. Wow! I haven't been by in awhile and you have been busy!!! Gorgeous work!